Leapfrog Creatr Review - Does the Leapfrog Creatr Work as Advertised? Leapfrog Creatr Review – Does the Leapfrog Creatr Work as Advertised? Dual extruding printers have always been an interest of mine ever since seeing Ninja flex bonded with PLA or ABS to make some really interesting objects like wheels with an embedded tire or soft hinges between rigid parts allowing for a more natural bending joint between the two. This really, to me at least, was a huge leap forward into what 3D printers really have to offer to the manufacturing process of parts. In the past with printers like the Makerbot 2x this was attempted with little success limit the user to only one type of filament even though they had the availability of two print heads. This almost destroyed any hopes at seeing it successfully done without needing to modify an existing open source printer; though finally it was found in the form of Leapfrog Creatr Dual Extruder. The main appeal of this machine over others is it’s wider range of officially supported materials including a sandstone esque material using a brick powder held within a plastic similar to PLA and ABS. Though it might be most exciting for it’s low cost compared to similar products coming in at only a little over 1,800. A truly exciting product but does it live up to the hype or does it fall flat like attempts before it; there’s only one way to find out. Final Recommendation: Is the Creatr Worth it? As with many of the other companies that have branched into 3D printing, the Dutch Leapfrog makes a very honest outward focus on spreading the knowledge and use of 3D printers in schools, businesses and home alike. They’ve been doing this for the last three years with their full range of printing solutions. Their story really starts with filling a gap that they needed in the company AV Flexologic who is known for their manufacturing of machine components and the like. They found themselves at a loss for prototyping any of their replacement parts they kept using over and over and found that the options available were either too expensive or too unreliable for operating with the amount of printing they needed. This lead them to start developing their own solution bringing together all the knowledge they had with previous machines and design to bring forth a no nonsense printer with enough versatility to suit their needs. This lead to the development of their first printer: the classic Creatr. While each model after kept this overarching title as an homage, they are far removed from their basic origin and offer up a line of products that would make any engineers or hobbyist elated. As you can plainly see they delivered on many of the goals they set out to with this printer, while not their first machine which was many aimed at filling a void this printer went above and beyond even that already respectable milestone. Firstly it’s major selling point is the Dual extruders with a plethora of materials and colors to choose from, at first glance this amazing but looking into the officially supported materials I’m a little let down with the lack of structurally different materials like a flexible material, though they do offer the ever so interesting brick material though without as many options as I would like to see. Another thing to note is the slightly smaller than average build area at only 250 x 200 x 200, another strike against this machine which by most standards should be an excellent choice. On top of this, the lack of open source hardware makes the machine very hard to mod or add your own parts and functionality, not to mention it has no onboard controls or ability to print without a pc connected to it via usb. The disappointment ends there though as what the machine does offer is fantastic with very high print quality and a quick enough build speed. Really what you are paying for here is a good step-up from a single extruder printer, which is enough reason in itself self to pay the extra 250 dollars from the basic model. There is always a reason to argue against a printer with a gimmick like this one, a doubt that it’s quality would equal that of a printer at the same price or sometimes even less. I understand the concern, but when the gimmick is on top of an already well performing machine with barely any more expense it becomes harder to argue against. 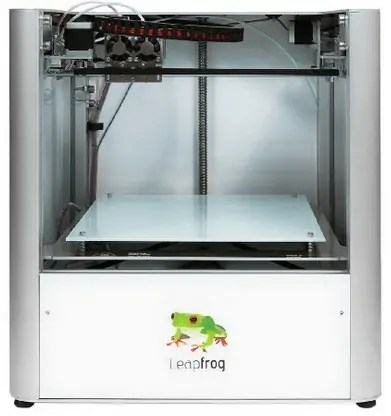 This is certainly the case with the Leapfrog Creatr; they’ve had success with their lines of printers and they took it to the next logical level without sacrificing the quality they were already known for. They should be commended for that, too many other businesses are recreating the same printer repeatedly without changing too much. However this machine departs far from that stale formula allowing for some true innovation on the side of the user; allowing you to tailor your prints to the exact needs of your designs. While initially it can be passed off as a neat benefit it really is some of the most interesting stuff to do with 3D printing. From hybrid prints to dissolvable support material it really brings a lot to the table, and if you are willing to tune your printer through some of the open sourced software you’ll be able to print some of the more obscure and difficult to filaments with ease..
All in all this is one the more exciting printers to write about, it invokes a lot of new and interesting thoughts on what is possible to do with currently available printers. Especially when compared to a couple of the other options out there for dual extrusion that offer only in the ways of different colors of the same material and for better or worse are far more limited in possibility and complexity when it comes to the nuances of printing in multiple materials and how the materials affect one another. I, for one, would recommend this printer; though with a word of warning. It might not be the easiest printer to step into, but not a nightmare either. Since it has to be connected to a computer the entire time be aware of your prints. I’ve heard many horror stories of whole prints lost to computer crashing or restarting in the middle of a six hour or more print that was in another room because the owner didn’t check up on it. with that said this printer has so much to offer to the garage inventor and the tinkerer it’s astounding. I can’t wait to look into what people have already been making with this machine. Sometimes it takes just a little extra to absolutely reverse an opinion, and with how unimpressed I was with the Makerbot 2x this machine has blown me away with it’s versatility, all around interesting design, and prospects; leaving me excited for the next generation of dual extruding printers. Overall, this is one of the better – more refined – dual extruder printers that I’ve tested so far. It does everything “well” without revolutionizing the industry or having any glaring defects.